György Ligeti’s best-known orchestral piece, thanks to the movie 2001: A Space Odyssey is Atmosphères, and it makes a compelling opening to this concert. Its evocative sense of mystery and its haunting stasis – it has no melodic or rhythmic motifs, only changes of texture and volume - are surely best heard as the first sounds in a programme, when the ear is freshest. The Berlin Philharmonic players are in full command of its tense quietude, and Rattle fully alive to its subtle changes of colour and dynamic. It also turns out to be a work worth seeing on DVD when the director can edit the film to show you how some of these strange sounds are actually made, such as the use of brushes rubbed over piano strings. I cannot tell how much the audience enjoyed it for they had no time to applaud, as the Ligeti faded to a close and the Prelude to Lohengrin followed at once, with barely any pause at all. Rattle presumably wanted to make a point about the similarity of aesthetic in the shining stasis of Wagner’s radiant string textures, and it worked rather well. The slender booklet is rather shy about this, dutifully listing the works separately with their separate timings, and of course they are separately tracked on the DVD so viewers can avoid the effect if they wish. (Rattle has done the same in concert with Sibelius symphonies 6 and 7, seeing the 7th almost as the true finale to the 6th.) The Wagner progresses in a noble stately reading, fully worthy of its high standing in the development of the orchestral music of the 19th century, and the Berlin strings really do glow. 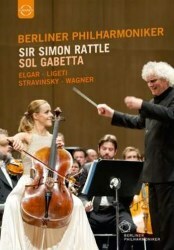 The Argentinian cellist Sol Gabetta made her debut with the Berlin Philharmonic at the 2014 Easter Festival in Baden-Baden with this performance of the Elgar Cello Concerto, a work she had already recorded with some success, for RCA in 2010 (also a live performance). Sony has also released this 2014 live Elgar concerto performance on CD (coupled with Martinů’s Cello Concerto No.1). So the work has become almost a calling card for her, and one can hear why from the outset. She launches into it with great passion and authority, and with gloriously rich tone. She clearly has a fine instrument and makes it speak, or rather sing, with high eloquence. Rattle too has recorded the work before, with Truls Mørk, on Virgin (1999), and the timings here are near identical to that one for the first three movements. The difference occurs in the finale, which takes over 2 minutes longer in Baden-Baden. Rattle and Mørk in the studio kept it moving along, while Rattle and Gabetta are that much more reluctant to reach the end of the slow valedictory music near the close of the work. In a concert performance on DVD this is very effective, and affecting. Another calling card closes the concert, for Rattle has frequently conducted and recorded Le Sacre du Printemps. The composer once called into question whether the traditions of this great orchestra – albeit under Karajan – could encompass the aesthetic of Le Sacre, but that was back in the 1960’s. As Rattle said of his players “these musicians can do anything” and so it is here. An orchestral player once told me that for anyone puritanical about the score, a live Rite of Spring is usually a chapter of accidents - but few that really matter. Nonetheless the Rite is a paradox – a highly sophisticated work aimed at the most primitive impact, and there is something to be said for a sophisticated Rolls-Royce band in negotiating its many complexities. I don’t know if Rattle has ever conducted it for dancers, but much of it sounds balletic here, and to its benefit. The Berliners’ fine sense of corporate rhythm helps of course, as do the skills of the wind and brass players. The filming and editing is always appropriate to what we are hearing, and the sound recording copes with the violent impact of some pages of the Rite, just as it does with the thresholds of silence in some of Atmosphères. Overall then this is rather more than a souvenir of a very good concert, for it enshrines four performances each of which is worth not only hearing, but rehearing.